As you may have picked up from previous posts, I’m really interested in the long-term implications of stress. A few months ago I was dissecting California killifish to survey their liver parasites and noticed that there was a lot of variability in the color and size of their gallbladders. I mentioned this to my awesome collaborator, Ryan Earley, whose lab I was visiting at the time and it turned out that he had made the same observation years earlier while working with convict cichlids. Among the many things he studies in his integrative animal behavior lab are the mechanisms underlying aggressive behavior and the physiological implications of aggressive interactions. He had the particularly cool insight that social stress (like getting picked on a lot) may affect digestion and may therefore be affecting gallbladder characteristics. When an organism is stressed out its body diverts energy away from functions that are non-essential in the short-term (like digestion) to more immediate needs (like having the energy to put up a good fight). If energy is diverted away from digestion for a long enough period of time, then you may be able to see differences in measures of digestion between individuals who have established themselves as socially dominant versus those who are subordinate. The gallbladder stores bile produced by the liver and will release this bile into the stomach, where it aides in the digestion of fats. 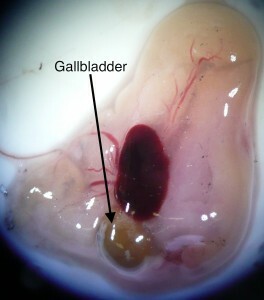 When the gallbladder doesn’t release bile for a long period of time, the retained bile concentrates (causing it to darken in color) and accumulates (causing the gallbladder to enlarge). The gallbladder may be retaining bile for 2 main reasons: 1) Stress is diverting energy away from digestion and is suppressing the release of bile from the liver, or 2) The stressed individual is consuming less food, so the trigger that the gallbladder uses for when it will release bile is faint or absent. 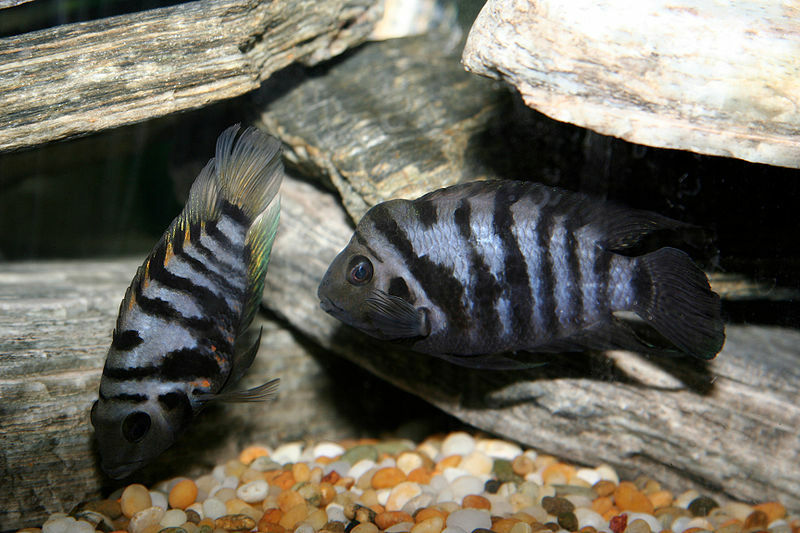 To determine if the variability in gallbladder size and color were correlated with social stress, Ryan arranged encounters between convict cichlids in which one fish was sure to establish dominance over another fish because of differences in body size. He also needed to differentiate between whether changes in gallbladder size where due to physiological stress responses or were because subordinate individuals were being denied access to food by dominant individuals. To accomplish this, in one of the experiments Ryan supplied so much food that the dominant fish ate all it could stand and returned to its refuge, leaving the subordinate fish a chance to eat however much it wanted. The results were clear. Subordinate individuals retained more bile which concentrated over time, resulting in large, green gallbladders (check out the paper for pictures!). Dominant individuals, on the other hand, had smaller gallbladders filled with colorless or hay-colored bile. This effect was seen even in the experiment in which subordinate individuals had plenty of access to food, suggesting that changes in gallbladder function are the result of stress suppressing digestive functions and not because of a lack of food to stimulate the gallbladder to release bile. One of the implications of this work is that it may help us to understand how stress may play an important role in the formation of cholesterol gallstones. When bile becomes overconcentrated it can form solid stones, which cause immense pain. Ryan’s work suggests that social stress may be a factor in gallstone formation! This is bad news for anyone experiencing lots of social stress, but good news in terms of our understanding of the environmental factors involved in gallstone formation. One of my favorite things about this study is that it’s a great example of how fish work can be relevant to humans. Fish and humans share similar mechanisms for dealing with stress, so the results from fish studies can shed light on how humans respond to stress as well. 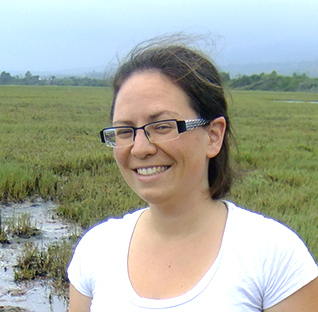 The publication associated with this study can be found here. I suggest reading every paper every written by Ryan Earley and his collaborators because they’re all awesome. Find them here.